Successfully saved Vegan Mexican Bean Burgers to your Calendar. You can also save the ingredients to your Grocery List. 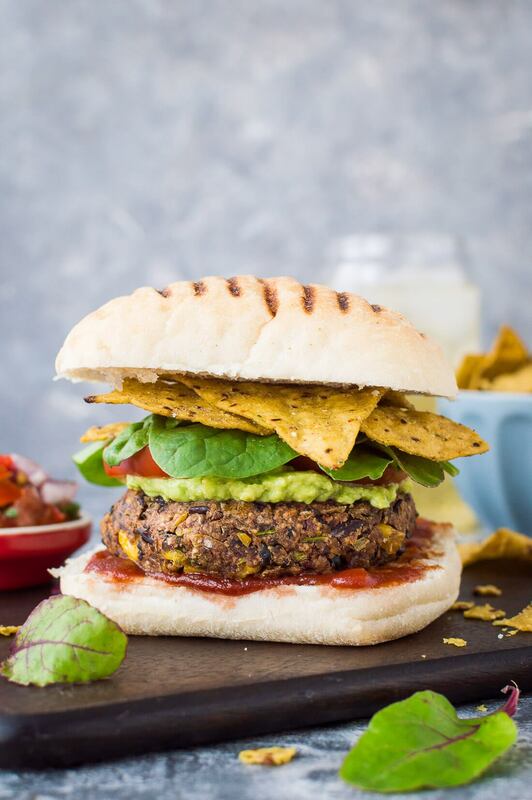 Vegan Mexican Bean Burgers – spicy black and kidney bean burgers with sweetcorn and chipotle. One of your five a day per burger! guacamole, tomato slices, lettuce, cheese slices, salsa, jalapeños, tortilla chips etc. 100 g (1 cup) rolled porridge oats 1 400 g (14oz) tin black beans (very well drained) 1 400 g (14oz) tin kidney beans (very well drained) 200 g (1 1/4 cups) cooked sweetcorn (well drained, defrosted if frozen) 2 cloves garlic (crushed) 2 spring onions ((scallions) thinly sliced) a handful fresh coriander ((cilantro) chopped) 1 Tbsp chipotle paste 1 Tbsp cajun seasoning finely grated zest of 1 lime and juice of ½ 25 g (3 Tbsp) dry breadcrumbs ½ tsp salt 6 burger buns guacamole, tomato slices, lettuce, cheese slices, salsa, jalapeños, tortilla chips etc.